the Tamil Nadu (tn) government is all set to ban non-reusable plastics. 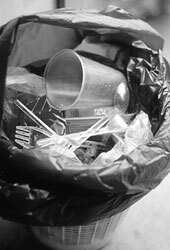 A bill that was tabled in the tn assembly recently proposes to prohibit the sale, storage, transport and use of plastic carrybags, cups, tumblers, plates, spoons, forks and knives. Once passed, it will be called the Tamil Nadu plastic articles (prohibition of sale, storage, transport and use) act, 2002. The bill has now been referred to a select committee for approval. Besides plastic products used in eateries, the bill also targets plastic wrappers used to pack magazines and periodicals. Stiff penalties For stringent implementation, the proposed act authorises an officer-in-charge to inspect any place suspected to be violating the provisions. And flouting these rules can prove to be an expensive proposition: those found selling, storing or transporting any plastic product will be fined Rs 5,000. Usage of the banned products will lead to a fine of Rs 100. In case of plastic wrappers, the amount mentioned is Rs 1,000. The food sector contravening the provisions will have to shell out around Rs 5,000 -- a figure that can extend to as much as Rs 50,000. If a person or organisation continues to breach the regulations, an additional amount of Rs 10,000 per day will be charged. Pros and cons After presenting the bill in the assembly, state minister for environment and forests P Mohan said that non-biodegradable plastic waste contaminates groundwater and hinders its recharge. Non-governmental organisations (ngos) and solid waste management experts have welcomed this bold move of the state. "The bill is one of its kind in the country and is a commendable first step," says Rajesh Rangarajan, Chennai coordinator of Toxics Link, an ngo working towards elimination of toxins from the environment. For solid waste management expert Almitra Patel, in spite of the exclusion of polyethylene terephthalate (pet) from the bill, the provision to ban non-reusable plastics is a step in the right direction. But others like Kisan Mehta, president of Mumbai-based ngo Save Bombay Committee -- which deals with waste management -- strongly voice the need to plug evident loopholes in the bill. "The proposed act does not prohibit the export of banned items outside the state. There has to be a total ban even on export so that such materials are not manufactured at all." Ravi Agarwal, coordinator of ngo Srishti, opines: "The bill does not address the issue of holistic plastic waste management and fails to encourage recycling of plastics." A B Akolkar, senior scientist with the Central Pollution Control Board (cpcb), feels that as tn is the first state to propose such a ban, it would be premature to comment on the move. The mood in the plastic industry is downbeat. "It seems the government is equating plastic articles with narcotics. Why else would officials be armed with powers to barge into people's houses to check for plastic articles?" laments B Swaminathan, chairperson of environmental committee, Tamil Nadu Plastic Manufacturers' Association (tapma). Other plastic industry representatives show similar concern. "Disposable plastic products are hygienic and carrybags are convenient to use. One cannot expect people to revert to the stone age," avers Anjum Vijay Lakra, director of Plastic Processors Ltd, a plastic recycling unit in Delhi. On being queried about suitable alternatives to the banned products, Sheela Rani Chunkath, chairperson of Tamil Nadu Pollution Control Board (tnpcb) explains, "We have introduced cloth bags which cost only Re 1 per piece and can be used in place of plastic bags." Taking a cue from tn, other state governments are also mooting the idea of a similar legislation. "The Haryana and Karnataka pollution control boards have already approached us for a copy of the bill," reveals Chunkath. However, with so many state governments having earlier failed to curb the plastic menace, all eyes are now on Tamil Nadu.